We are so excited to launch our new #SS15 ad campaign. ESCAPE WITH THE LUXURY OF LAYERED RINGS. The Neon Sign Boneyard inspires me. I had been wanting to visit here for decades. It was even more beautiful than I could have imagined. Nothing inspires me like colors that are naturally faded by the sun into de-saturated ombres. Breathtakingly gorgeous, raw and inspiring. I am obsessed with Americana. This photo above is one of my favorites..
introducing the new Blue Jean Icicle Hoops. Luxury meant to be worn everyday. How did you get into jewelry? What do you love most about it? I grew up in and around antiques. My mom was an antique dealer and enthusiast. I always thought this was normal until I started becoming aware at sleepovers and playdates that not everyone lived in a house with old and extremely breakable things. Jewelry was an extension of that passion for my mom and for me as well. My favorite thing to do as a child was to go to the safety deposit box with my mom and have her tell me our family history and stories through these precious objects. What I love most about jewelry is two-fold. I obviously love how beautiful jewelry is. There is nothing else in the world that rivals an exceptional Art Deco diamond ring or an opal with lots of fiery intensity. But really, I love how these little treasures carry our energy and stories within them. There’s something about a diamond ring that a woman wore every day for 60 years, or an Edwardian brooch worn for generations in a family on special occasions. I believe pieces like these carry energy, that there is something magnetic about them. It gives me the chills just thinking about it. Tell us a little about your blog? I started my blog at the same time I launched my website. I really love sharing my experiences and finds from out in the jewelry world and around the internet. I was very resistant to a jewelry focused instagram but now I love it! It's so satisfying to on-the-go share with the people that follow and support me. It's also put me in a community of fellow jewelry enthusiasts that love the same things I do. What is your passion when it comes to jewelry? I love antique and vintage pieces with great design. I shouldn’t say this because I’m a GG, but sometimes it’s more about a great setting or the look of the piece rather than if it has a perfect stone. I love the way colored stones can come together in an unexpected way. I love a great designer's pieces. This past winter, Verdura celebrated its 75th anniversary with an exhibit in NY. It was exhilarating to see famous pieces that have only been seen in photos for so many years, like Coco Chanel’s cuffs she wore every single day. I was in awe of every single piece, I had to be dragged out kicking and screaming. What is your favorite piece of jewelry in the JJ Number 8 collection? Oh my gosh, that's so hard, I love them all!! I think my ab fab faves are the signature 2-Tone Marquise Hoops in yellow gold. I would wear those so hard! Diamond Doodles is a new art concept born from the imagination of Hannah Becker. 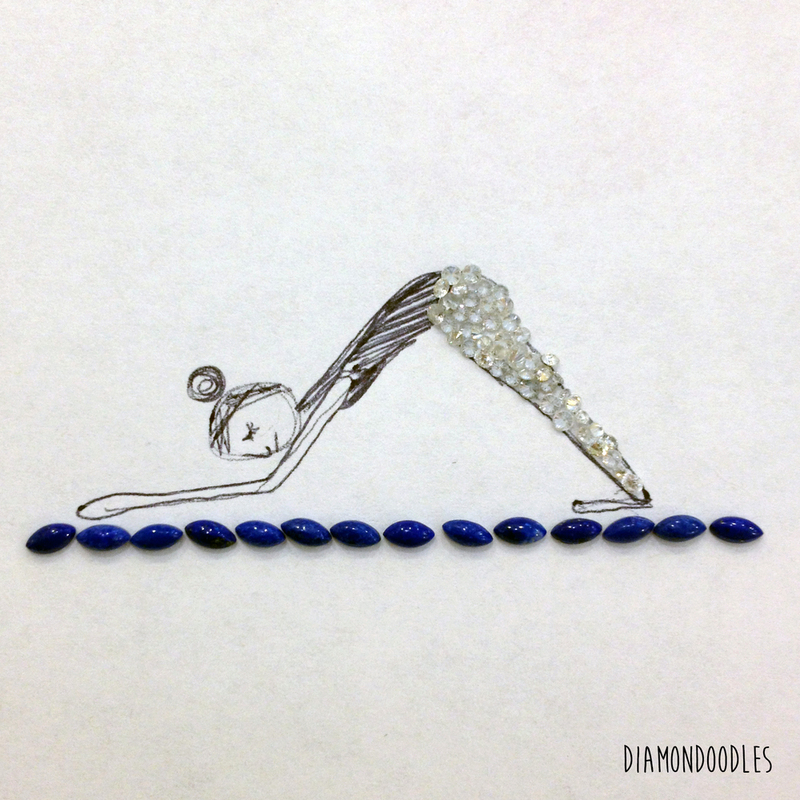 Hannah creates art from loose gemstones in fun, clever doodles that always make me smile. I first met Hannah at GIA as she was a student there who I had the pleasure of mentoring. It is such a joy to see her pave the way with her new break-through art. To see more art, be sure to follow Hannah on Instagram at @diamondoodles. lifestyle and its marquise gemstones. So appropriate because I was just snorkeling with turtles last week! 1. How did you get into doing Diamond Doodles? I started Diamondoodles during my down time while working in production for Gumuchian. I would be making parcels of stones and would become inspired by the abstracted shapes they would take on during the sorting process. After the first dozen or so doodles, I started seeking out stones in the office that I wanted to use for drawings. I draw inspiration from all over the place. Some days it's the stones I have to work with that give me direction; the color or shape will remind me of something and the drawing jumps off from there. Other times I think "Can I make (blank) out of stones?" and then hunt around and do a few sketches to get the right set up. What do you love most about JJ Number 8 jewelry? I love the beauty in the simplicity of the JJ Number 8 pieces. The marquise cut has been given a new life in the pieces and really demonstrates great grace and balance in JJ Number 8 jewelry. What's not to love about the juicy colors in this playful stack? We are proud to support the charity Heroes for Children. Heroes for Children advocates for and provides financial and social assistance to families battling cancer. Help the cause by buying a $25 raffle ticket and a chance to win beautiful JJ Number 8 jewelry. Our vision is that no family with a child battling cancer will fight alone. We are so happy and celebrating that Downton Abbey won at last night's SAG awards for Outstanding Performance. Did you know that Joanne Froggatt who plays the character of Anna, the Lady's Maid to Mary Crawley, loves marquise gemstones? Here she is last night wearing her marquise engagement ring in the "hand-cam" from the SAG awards. This east-west setting is gorgeous and one of my favorites. The marquise gemstone has a beautiful, timeless elegance and sophistication- it's the essence of JJ Number 8 jewelry and what excites and inspires me as an artist. Congratulations Joanne and Downton Abbey. I am launching a new series called Celebrating Women to celebrate women who inspire me. I think there is nothing more powerful or important than women cheering on and supporting other women. I kick off the series with Jennie Urman. She is the Showrunner and in charge of the hit new TV series "Jane the Virgin." Watch "Jane the Virgin" on Mondays at 9pm (8pm Central) on the CW network. I am obsessed with these new hoops. I love the freeform, organic shape and pattern of the marquise gemstones. They are so fun and playful. I love the marquise stackable rings. They come in every color of the rainbow. You can mix and match them to create an endless number of unique color combinations and match them with every outfit. The colors just make me so happy. You can stack two to three rings per finger. Fun! MUST SEE. HOLIDAY GIFT GUIDE. We all love Beyonce's jam, "If he liked it then he should have put a ring on it." But what if he didn't "put a ring on it" because he actually just didn't know your ring size? Every lady needs to know her ring size. If you don't know yours, it's important to go out and get your fingers sized. I recommend knowing the ring sizes for all of the fingers on your hand. That includes your: ring finger, middle finger, pointer finger and pinkie. You never know which finger you're going to want to put a new bauble on! Also keep in mind that the fingers on your left hand can be a slightly different size than those on your right hand. It's important to know your ring size so that you're always prepared for that special moment. And trust me, your man will thank you too. It will make his life sooooo much easier. Love makes us all Equal. Diamonds just make everything better.